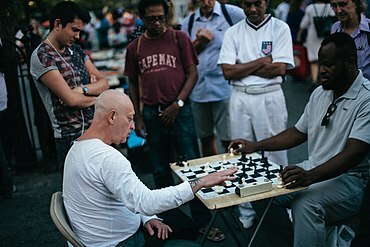 Spectators watch as a street chess player plays bullet chess with Jonathan Corbblah in Union Square, Manhattan. Fast chess (also known as speed chess) is a type of chess in which each player is given less time to consider their moves than normal tournament time controls allow. The rules specify a cumulative total time for moves for each side. In a fast chess game, each player will have less than the usual 60 minutes at their disposal, based on a 60-move game, and sometimes considerably less time. Fast chess is further subdivided, by decreasing time controls, into rapid chess, blitz chess, and bullet chess. Armageddon chess is a particular variation in which different rules apply for each of the two players. The 2018 world rapid chess champion is Daniil Dubov from Russia, and the 2018 world blitz chess champion is Magnus Carlsen. Ju Wenjun from China is the 2018 women's world rapid champion, and Kateryna Lagno from Russia is the 2018 women's world blitz champion. The World Chess Federation (FIDE) divides time controls for chess into "classical" time controls, and the fast chess time controls. As of July 2014[update], for master-level players (with an Elo of 2200 or higher) the regulations state that at least 120 minutes per player (based on a 60-move game) must be allocated for a game to be rated on the "classical" list; for lower rated players this can be reduced to as little as 60 minutes. Games played faster than these time controls can be rated for rapid and blitz if they comply with the time controls for those categories. A fast chess game can be further divided into several categories, which are primarily distinguished by the selection of time controls. Games may be played with or without time increments per move. Time controls for each player in a game of rapid chess are, according to FIDE, more than 10 minutes, but less than 60 minutes. Rapid chess can be played with or without time increments for each move. In a game where time increments are used, a player can automatically gain, for instance, ten more seconds on the clock after each move. In a case where time increments are used, the total time per player for a 60-move game must be more than 10 minutes, but less than 60 minutes. For the FIDE World Rapid Championship, each player will have 15 minutes, plus 10 seconds additional time per move starting from move 1. The United States Chess Federation (USCF) quick chess rating for players is based on games with time controls per player greater than 10 minutes, up to a maximum of 65 minutes. Games between 30 and 65 minutes per player are dual rated for both quick and regular ratings. Time controls for each player in a game of blitz chess are, according to FIDE, 10 minutes or less per player. This can be sudden death, with no time increment per move, but it may also be played with a small increment per move—a more recent development due to the influx of digital clocks. Three minutes with a two-second increment is preferred. In the case of time increments, the total time per player for a 60-move game must be 10 minutes or less (hence averaging 10 seconds or less per move). For the FIDE World Blitz Championship, each player has 3 minutes, plus 2 seconds additional time per move starting from move 1. The USCF define blitz chess as time controls between 5 and 10 minutes per player. The terms blitz or blitzkrieg in chess sometimes means a quick attack on the f7- or f2-square early in the game, putting the king in check. This term is not limited to fast chess. A variant of blitz chess, bullet chess games have less than three minutes per player, based on a 40-move game, and this extends down to one-minute-per-player games; lower time controls are called 'hyperbullet' and 'ultrabullet' for 30-second-per-player and 15-second-per-player games, respectively. Other time control options for bullet games include 2 minutes with one-second increment or 1 minute with a two-second increment. The term lightning can also be applied to this variant. Online bullet chess also avoids practical problems associated with live bullet chess, particularly players accidentally knocking over the pieces. Under USCF rules, bullet games are not ratable, referring to any time control below five minutes. A game guaranteed to produce a decisive result, because Black has draw odds (that is, for Black, a draw is equal to a victory). To compensate, White has more time on the clock. Common times are six minutes for White and five for Black, or five minutes for White and four for Black. This can also be played with a small increment. This is also known as "time odds" and it is used in various tie breaks for quick tournaments. An example of Armageddon was played by Ian Nepomniachtchi versus Hikaru Nakamura at the 2015 FIDE World Cup. A general term for extremely fast chess. It can also refer to games with a fixed time (e.g. ten seconds) for each move. This also can be used for one-minute games. Used by FIDE, from 1987 to 1989, to refer to rapid chess. Before the advent of digital clocks, five minutes per side was the standard for blitz or speed chess. Before the introduction of chess clocks in the mid-1950s chess club "rapid transit" tournaments had a referee who every ten seconds called out. The Washington Divan (2445 15th St. NW) had regular weekly games and used a special clock that beeped every ten seconds to indicate the time to move. Players had to use their full ten seconds and move on the bell. In 1988 Walter Browne formed the World Blitz Chess Association and its magazine Blitz Chess, which folded in 2003. In some chess tournaments and matches, the final standings of the contestants are decided by a series of games with ever shortening control times as tie breaks. In this case, two games may be played with each time control, as playing with black or white pieces is not equally liked among players. The short time controls in fast chess reduce the amount of time available to consider each move, and may result in a frantic game, especially as time runs out. A player whose time runs out automatically loses, unless the opposing player has insufficient material to checkmate, in which case the game is a draw. "Losing on time" is possible at even the longer, traditional time controls, but is more common in blitz and rapid versions. Play is governed by the FIDE Laws of Chess, except as modified by a specific tournament. However, in case of a dispute during a tournament, either player may stop the clock and call the arbiter to make a final and binding judgment. Chess boxing uses a fast version for the chess component of the sport. The rules for fast chess differ between FIDE and the USCF. With the USCF, a game is considered to affect the Quick rating with more than 10 minutes, but up to 65 minutes, time controls per player. As 30 minute to 65 minute per player time controls are also under the Regular rating system, these games affects both the Quick and Regular ratings, and are known as dual rated games. However, the K factor (a statistic used for ratings) is reduced by comparison, meaning that players will either lose or gain (or rarely both) less rating points compared to a solely Quick or Regular game. Any time control over 65 minutes counts under the Regular rating only. All of these time controls include the delay added to the time control, such as a 60 minute with a 5-second delay is still considered to be a 60-minute game, not a 65-minute game. As of March 2013, the USCF has also added a separate Blitz class rating, for any time control between 5 and 10 minutes per player. It is not possible for a game to be dual rated as both Blitz and Quick. Unlike Quick chess, 5 minutes can also mean game 3+2 (three minutes with a two-second increment). Both FIDE sponsored official, and unofficial, World championships for fast chess have been held since the seventies. The World Rapid and Blitz Championships 2016, as well as the Women's World Rapid and Blitz Championships 2016, were held in Doha, Qatar in December 2016. In 1987, Garry Kasparov (the World Champion of classical chess at the time) and Nigel Short played a 6-game exhibition Rapid match ("Speed Chess Challenge") at the London Hippodrome, won by Kasparov 4–2. The 1988 victory by Anatoly Karpov in Mazatlan was officially called the World Active Championship, but FIDE changed the word 'active' to 'rapid' soon after. In 1992 FIDE held the Women’s World Rapid and Blitz Championship in Budapest, Hungary. Both Rapid and Blitz Championships were won by Susan Polgar. The 2001 victory by Garry Kasparov in the FIDE World Cup of Rapid Chess (organized by the French Chess Federation in Cannes) was held contemporaneously to the Melody Amber rapids (thus splitting the top players between the two events), and is sometimes considered to be official, but it was never named as a "championship" but rather a "world cup". Viswanathan Anand won the official FIDE 2003 Rapid Championship at the 6th Cap d'Agde event. After no bids in 2004, FIDE optioned the 2005 Rapid to Cap d'Agde, but it was not held. Teimour Radjabov won the 2006 7th Cap d’Agde Rapid Chess Tournament, but this had no FIDE status. The yearly Frankfurt or Mainz events hosted by the Chess Tigers (2001–2010) were considered as the traditional rapid chess championship, sometimes being billed as a world championship. In its last two years, the 2009 Grenkeleasing World Rapid Chess Championship in Mainz was won by Levon Aronian, and the 2010 Open GRENKE Rapid World Championship in Mainz was won by Gata Kamsky. However, these are not official titles. The Association of Chess Professionals (ACP) also held a World Rapid Cup in some of these years, and the annual Amber chess tournament (1992 to 2011) also had a rapid segment. There was also occasionally a Eurotel Trophy or Intel Grand Prix event, each of which would be of high stature. The first unofficial Speed Chess Championship of the World (or World Blitz Championship) was held in Herceg Novi on 8 April 1970. This was shortly after the first USSR versus the rest of the world match (in Belgrade), in which ten of these players also competed. Eleven Grandmasters and one International Master played a double round-robin tournament. Bobby Fischer won first place, with a score of 19 points out of a possible 22. Fischer scored seventeen wins, four draws, and one loss (to Viktor Korchnoi). Mikhail Tal was a distant second, 4½ points behind. Fischer won both games against each of Tal, Tigran Petrosian, and Vasily Smyslov; all of them being past World Champions. By 1971 the Russian and Moscow five-minute championships had been going several years, with Tal, Bronstein and Petrosian all having success. That year Fischer played in a blitz tournament organised by the Manhattan Chess Club, who scored 21½/22. There were also strong tournaments in Bugojno (in 1978), which was won by Karpov; and Nikšić (in 1983), which was won by Kasparov. In 1987 the S.W.I.F.T super-tournament was held in Brussels, Belgium; first prize was shared by Garry Kasparov and Ljubomir Ljubojević. The first FIDE-sponsored World Blitz Championship was won by Mikhail Tal in 1988. In 2000 Anand won the Plus GSM World Blitz Chess Cup, which has been sometimes referred to as a Championship, but there is no contemporary acknowledgement of this title. The second World Blitz Championship was won by Alexander Grischuk in 2006 in Rishon Lezion, Israel; the third World Blitz Championship was won by Vassily Ivanchuk in 2007. The 4th World Blitz Championship was held in Almaty in 2008, and was won by Leinier Dominguez Pérez of Cuba. In 2009 and 2010 there was an event called the World Blitz Championship, held after the Tal Memorial in Moscow in November. They were won by Magnus Carlsen (in 2009) and Levon Aronian (in 2010), with the Women's Championship being won by Kateryna Lagno (in 2010). There is no record of 2009 event in the FIDE Calendar for that year. However, the minutes of the October 2009 FIDE Congress discussed whether it should be a "proper" Championship (given the qualification scheme), and left the decision to the corresponding internal Commission. For 2010, it was organized in conjunction with FIDE from the beginning. However, in neither case was an arbiter's report presented to the next FIDE Congress or General Assembly, as would be expected for a World Championship and indeed occurred previously with the 2008 Blitz Championship. The 2012 Arbiter's report refers to 7th World Blitz Championship thus seeming to imply that 2009 and 2010 events were indeed Championships; although this report can be faulted for referring to the rapid championship of 2012 as being the 1st World Rapid Championship, which at the very least forgets Anand's official Rapid Championship in 2003. The balance of the evidence favors these Blitz Championships as being counted as official. In 2011 there was no official blitz championship held, but FIDE was involved with the Sport Accord Mind Games blitz won by Maxime Vachier-Lagrave, with Hou Yifan winning the women's division. Since 2012 FIDE have held joint World Rapid and Blitz Championships most years, with some years Women's World Rapid and Blitz Championships also being held. In 2012 the World Rapid and Blitz Championships were held at Batumi, Georgia and Astana, Kazakhstan (Women's Championships). Sergey Karjakin won the Rapid Championship. Alexander Grischuk won the Blitz Championship. Antoaneta Stefanova won the Women's Rapid Championship. Valentina Gunina won the Women's Blitz Championship. In 2013 the World Rapid and Blitz Championships were held at Khanty-Mansiysk, Russia. Shakhriyar Mamedyarov won the Rapid Championship. Lê Quang Liêm won the Blitz Championship. In 2014 the World Rapid and Blitz Championships were held at Dubai, UAE and Khanty-Mansiysk, Russia (Women's Championships). Magnus Carlsen won both Rapid and Blitz Championships. Kateryna Lagno won the Women's Rapid Championship. Anna Muzychuk won the Women's Blitz Championship. In 2015 the World Rapid and Blitz Championships were held in Berlin, Germany. Magnus Carlsen won the Rapid Championship. He also received the privilege of playing at a dedicated Board 1 the whole time, not having to move while others did. The given reason was that Norwegian television was sponsoring the event, and moving the heavy cameras around would be too much hassle. After his first round draw, he should not have been on Board 1 until Round 8 when he caught the leaders. Carlsen himself later called this "weird" that Board 1 would be reserved for him. Alexander Grischuk won the Blitz Championship. In 2015, FIDE did not receive the expected 80,000 euros from Agon's organization of the event, causing a budget shortfall of 55,000 euros. It was later announced that approximately 200,000 euros were lost on the event. In 2016, the World Rapid Championships were held at the Ali Bin Hamad Al Attiya Arena in Doha, Qatar. Vassily Ivanchuk of Ukraine won the 2016 World Rapid Championship, while Carlsen, after defending his title with difficulty in 2015, came in third place. In the Blitz Championship, Sergey Karjakin of Russia and contender in the recently held World Chess Championship 2016 won the championship title albeit due to a better tiebreak over the second place Carlsen. Karjakin defeated Carlsen in their individual encounter. Carlsen was once again reserved board 1 for both championships. Anna Muzychuk also from Ukraine, won both the 2016 Women World Rapid and Blitz Championshipship. At the FIDE Presidential Board meeting at the end of March 2016, they gave Agon six months to find an organizer for the 2017 event. At the Baku General Assembly in September it was announced they had extended this deadline until the end of 2016. The issue of the non-payment of the players for the IMSA Mind Games was also brought up. ^ a b "FIDE Rating Regulations effective from 1 July 2014". FIDE. For a game to be rated, each player must have the following minimum periods in which to complete all the moves, assuming the game lasts 60 moves. Where at least one of the players in the tournament has a rating 2200 or higher, each player must have a minimum of 120 minutes. Where at least one of the players in the tournament has a rating 1600 or higher, each player must have a minimum of 90 minutes. Where all the players in the tournament are rated below 1600, each player must have a minimum of 60 minutes. ^ a b c d e "FIDE Handbook – E.I. Laws of Chess – For competitions starting on or after 1 July 2014 – Appendices". World Chess Federation. Retrieved 27 July 2014. A.1 A ‘Rapidplay’ game is one where either all the moves must be completed in a fixed time of more than 10 minutes but less than 60 minutes for each player; or the time allotted plus 60 times any increment is of more than 10 minutes but less than 60 minutes for each player. ... B.1 A ‘blitz’ game’ is one where all the moves must be completed in a fixed time of 10 minutes or less for each player; or the allotted time plus 60 times any increment is 10 minutes or less. ^ a b "Regulations for the FIDE World Blitz Championship 2015 & FIDE World Rapid Championship 2015" (PDF). FIDE. 2015. Retrieved 18 January 2016. ^ a b c d e f g h "Rulebook Changes" (PDF). USCF. 2016. Retrieved 2 October 2016. There are three separate rating systems. A player’s Blitz rating is calculated if he or she participates in events with total playing times of G/5 – G/10. A player′s – Quick rating is calculated if he or she participates in events with a total playing time greater than 10 minutes and less than 30 minutes. A player’s Regular rating is computed if he or she enters a tournament with the total playing time of G/30 or slower. Games with total playing times of G/30 – G/65 are used to calculate both Regular and Quick ratings at the same time. ^ Kidder, Harvey (1960). Illustrated Chess for Children. Doubleday. ISBN 0-385-05764-4. ^ "ICC Help: bullet". ICC. Retrieved 6 October 2016. ^ "Why are there three different ratings in Live Chess?". chess.com. Retrieved 6 October 2016. ^ "ICC Help: one-minute". ICC. Retrieved 6 October 2016. ^ "Armageddon Tiebreakers". about.com. Retrieved 18 January 2016. ^ PeterDoggers (19 September 2015). "World Cup: Nakamura Wins Armageddon, Nepomniachtchi Appeal Rejected". chess.com. Retrieved 18 January 2016. ^ a b c "Rapid Chess". Business World. 6 January 2013. Retrieved 15 October 2015. ^ The Web Novice. "Mechanics Institute newsletter #166". Chessdryad.com. Retrieved 18 December 2011. ^ "FIDE Calendar 2016". FIDE. Retrieved 14 June 2016. ^ Keene, Raymond (3 April 1987). "Boxed Set". The Spectator. ^ Arkham Noir (1 June 2011). "Kasparov vs Short – Speed Chess Challenge Pt.1" – via YouTube. ^ a b c d "1992 Women's World Rapid and Blitz Championship". ^ Mark Weeks. "World Chess Championship 2001–02 Braingames & Einstein". ^ "LA Times report on Cannes 2001 World Rapid Cup". ^ a b "FIDE announcement that Anand is World Rapid Champion". ^ "ChessBase report on 2006 Cap d'Agde". ^ "Anand Wins Rapid Championship at Mainz; Navara Wins Open". ^ "Chess Classic Mainz Ends". ^ "Chess.com report on Mainz 2009". ^ "TWIC report on Mainz 2010". ^ a b c d e "Blitz Championship History (archived)". Archived from the original on 24 December 2008. ^ Keene, Raymond (18 April 1987). "CHESS; 18 Apr 1987; The Spectator Archive". The Spectator Archive. Retrieved 12 January 2018. ^ "1987 S.W.I.F.T. Brussels". Retrieved 12 January 2018. ^ "The Hindu story about Anand winning the "Cup"". ^ "Organizer's vita of Anand at 2012 Champs". Archived from the original on 27 November 2014. ^ "Dominguez-Perez wins World Blitz Championship in Almaty". chessbase.com. 11 August 2008. Retrieved 14 June 2016. ^ a b "Magnus Carlsen wins blitz championship". ^ a b c "FIDE Archive: World Blitz Championships – Finals". ^ a b "GM Kateryna Lahno wins the Women's World Blitz Championship 2010". Fide.com. 18 September 2010. Retrieved 8 December 2013. ^ "80th FIDE Congress, Halkidiki (Oct 2009), Minutes 5.39 and Annex 33". ^ "Arbiter's Report, Annex 35 to 79th FIDE Congress (Dresden 2008)" (PDF). ^ "Arbiter's Report, Annex 48 to the General Assembly (Istanbul 2012)" (PDF). ^ "Sport Accord Mind Games: blitz results". ^ "Magnus Carlsen vs Dennis Wagner, World Chess Rapid Championship 2015, Round 2 Full game". youtube. Retrieved 15 June 2016. ^ a b c "FIDE Calendar Archive". FIDE. Retrieved 20 September 2016. ^ a b "World Rapid Championship 2012, Karjakin wins". ^ a b "World Blitz Championship 2012, Grischuk wins". FIDE. 9 July 2012. Retrieved 15 October 2015. ^ a b c d "FIDE Archive: Women's World Rapid and Blitz Championships 2012". ^ a b "Shakhriyar Mamedyarov became the World Rapid Chess Champion". ^ a b "Le Quang Liem is the World Blitz Chess Champion". ^ a b "Magnus won the World Blitz Championship 2014". ^ a b "Magnus Carlsen wins FIDE World Rapid Championship!". ^ a b "Kateryna Lagno crowned Women's World Rapid Champion". ^ a b "Anna Muzychuk is Women's World Blitz Champion". ^ a b "Magnus Carlsen wins 2015 FIDE World Rapid Championship!". ^ "World Rapid: Carlsen On Top, But With A Surprising Name". ^ Heinz, Herzog. "Chess-Results Server Chess-results.com – FIDE World Rapid Championship 2015". chess-results.com. ^ "More Top Seeds Cede Lead In Qatar Round 2". chess.com. ^ a b "Alexander Grischuk is a new World Blitz Champion". ^ The title isn't exactly a historic one, Kasparov's in 2001 was the first. ^ "Vassily Ivanchuk is new World Champion in Rapid Chess". ^ a b "Double gold for Ukraine in FIDE World Rapid Championship". ^ a b ChessBase staff (28 December 2018). "FIDE World Rapid Champions: Dubov and Ju". ChessBase. Retrieved 28 December 2018. ^ "FIDE "Women" World Rapid Ch. 2016 Final Ranking after 12 Rounds". ^ "A Brief History of Fast Chess". ^ "World Champion Eliminated From Blitz Chess Tournament". ^ "FIDE Announcement of World Blitz Championship 2006". ^ "FIDE World Blitz Championship". ^ "FIDE announcement of World Blitz Chess Championship 2007". ^ "Dominquez wins World Blitz Championship!". ^ a b "Karjakin wins FIDE World Blitz Championship, double gold for Anna Muzychuk". ^ a b ChessBase staff (30 December 2018). "FIDE World Blitz Champions: Carlsen and Lagno". ChessBase. Retrieved 30 December 2018. ^ "Carlsen Willing to Take Revenge at World Rapid and Blitz Championships". chess-news.ru. ^ a b c d "Quotes About Blitz Chess". Chessquotes.com. Archived from the original on 20 June 2012. Retrieved 27 July 2012. ^ "Kramnik on Nakamura, blitz and Carlsen". Chess in Translation. 10 November 2010. Retrieved 10 November 2012. ^ "Kramnik on blitz". Chess in Translation. 16 November 2009. Retrieved 10 November 2012. ^ "Nigel Short: 'I Understood That Kasparov Was Very Vulnerable'". chess-news.ru. 1 November 2011. Retrieved 24 June 2013. ^ "Vladimir Malakhov: chess player, nuclear physicist". Chess in Translation. 5 September 2010. Retrieved 10 September 2014. ^ Nakamura, Hikaru. "Paris Grand Chess Tour 2016". Quote is at 05:02. Harper, Bruce; Nakamura, Hikaru (2009). Bullet Chess: One Minute to Mate. Russell Enterprises. ISBN 978-1-888690-67-5.